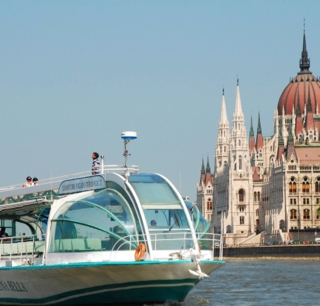 The city of Budapest is divided by river Danube: the calm, peaceful Buda and the bustling, always busy Pest are separated by the Danube but connected to each other by 8 beautiful bridges, each with its own story to tell. These bridges are not only famous for their structures but also as historical monuments and you can take a look at them on our different cruises. They all shared the same fate, having been destroyed during the WWII and then rebuilt years later. 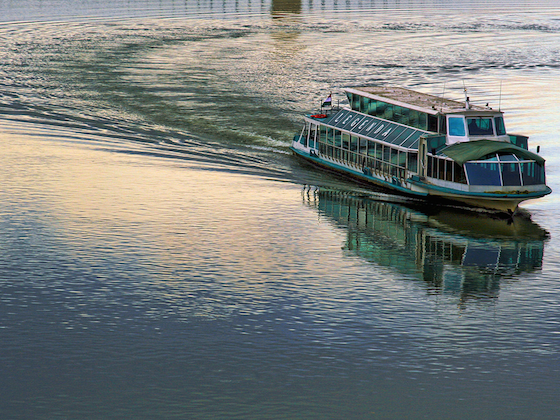 Let us take you along this beautiful river from bridge to bridge as if on a cruise. Built in 1894 as part of the series of ceremonies organized to commemorate the 1000th anniversary of the arrival of the Magyars (Huns) in the Carpathian Basin. When driving on to the bridge from either side, two large pillars are seen and on top of each is the mythical Turul bird. 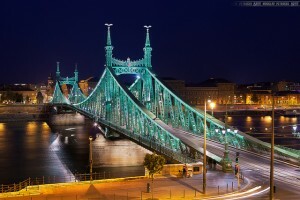 Unfortunately, Liberty Bridge (Szabadsag Hid), as all the other bridges in Budapest, was blown up in 1945 by retreating German troops and then rebuilt and reopened in 1946, but, due to a lack of paint, it only regained its dark green colour 40 years later. As Liberty Bridge is the shortest bridge in Budapest, you can easily walk across it over the River Danube in a couple of minutes. 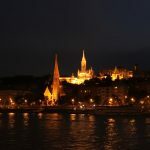 Having then reached the Buda end of the bridge, you get to Gellert Square at the foot of Gellert Hill, hosting Hotel Gellert and Gellert Spa being famous for its thermal water. Check out this famous thermal spa, its world-famous massages and other services. 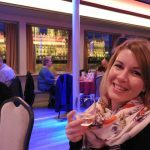 Do as the locals do, and watch the sunset from Liberty Bridge as it passes down behind the mountains and if you cannot have enough of it, enjoy the sunset in Budapest on the Danube from one of our river cruises. Designed by the English engineer T.W.Clark, this construction is the first in many things. 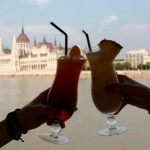 It was the first permanent bridge between Pest and Buda, taking over ten years to build. At that time this suspension bridge was the longest in Europe. With just two magnificent towers supporting the structure with giant iron chains, Chain Bridge is an unmissable sight of Budapest. 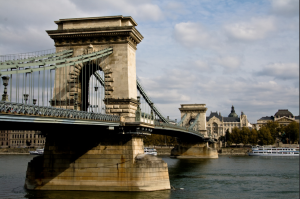 The chains gave the bridge its name, Lanchid, Hungarian translation for chain bridge. People used to joke that it was built so that the bridge could be dragged into the tunnel during the rain. The history of Chain Bridge (Lanchid) is just as rich as its ornaments. Stone lions guard the bridge on either side. Professedly, the sculptor threw himself in the river when, during the opening ceremony, a spectator said that the lions had no tongues. In reality they do have tongues, they are just not visible and the sculptor lived happily ever after. Although it is the oldest bridge in Hungary, being built in 1849, it still is the most magnificent and most photographed bridge in Budapest. 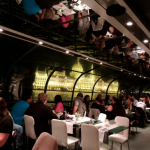 It became an international sensation within a blink of an eye and is still one of the symbols of Budapest. It was originally planned for the 1996 World Expo and, interestingly, debates surrounded its naming both during the construction and then several years later, as well. 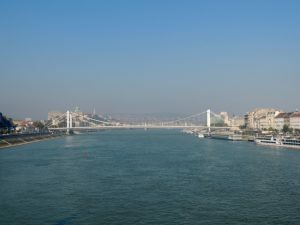 This was the first bridge in Budapest named after a place – it was called Lagymanyosi Bridge until 2011- and not a person. 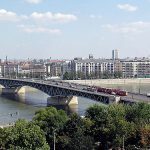 The Rakoczi Bridge (Rakoczi Hid) is the second newest bridge in Budapest opened in 1995 and its current name refers to a noble family playing an important part of the Hungarian history. 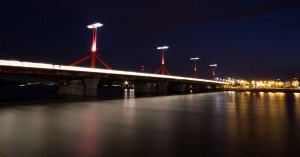 Not only the name but its design stirred serious arguments among locals, some of them even saying that the red poles of the bridge look like red oil pumps. 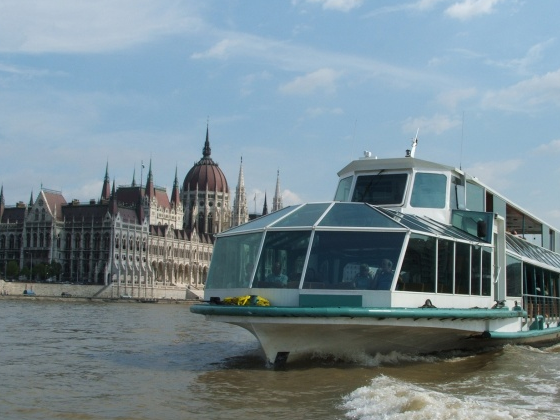 The bridge is named after one of the most revolutionary and romantic poet of Hungarian literature, Sandor Petofi. 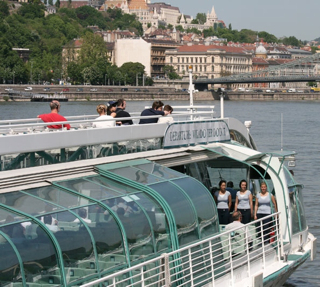 This bridge is highly likely to be voted as the least inspiring structure of the bridges of Budapest, but with the vibrant A38 club – the reincarnation of a Ukranian stone-carrier ship currently voted one of Europe’s coolest clubs – being by the foot of Petofi Bridge, the area is an important venue in both Budapest’s cultural life and transport. Named after Queen Elizabeth (known as Sissy), the beloved and respected empress of the Austro-Hungarian monarchy assassinated in 1898 by an anarchist. Although, the original and decorative looking bridge was built at the end of the nineteenth century, it sustained damage in WWII leaving Elizabeth Bridge beyond repair. 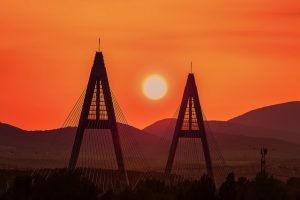 Unfortunately, the communist era did not wish to restore its beauty, therefore the new, modern looking bridge, reconstructed in 1961, is completely lack of any ornamentation, but has nonetheless a graceful appearance thanks to its slender cables, color and structure. Arpad Bridge is named after the leader of the seven tribes of Magyars who rode into the Carpathian basin in the 9th century. 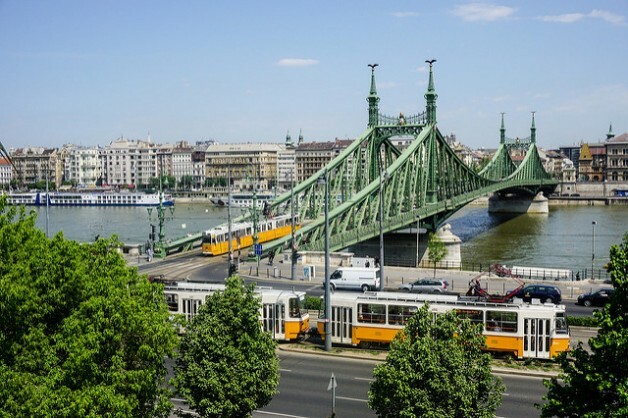 The bridge, which is in connection the tips of Margarete Island and Hajogyari Islands (the venue of the famous Sziget Festival), is not exactly a sheer example of beauty, but it is one of the capital’s main transport links. The longest and newest bridge of the capital city, opened in 2008, is a cable-stayed construction that constitutes an important section of the M0 ringroad. 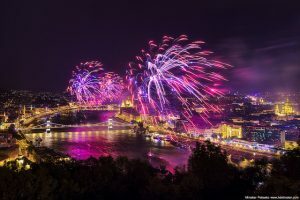 An online poll on the naming of the bridge caused both national and international controversy and received widespread media attention when American comedians Stephen Colbert and Jon Stewart won, while Miklos Zrinyi, Hungarian poet, statesman and military leader became only third.